Ah, grocery shopping. Most of us have to shop for our food at least some of the time. But trying to cram it in around work, school, family — you know, life — can make us want to gnaw coupons. Inspired in part by Marion Nestle's What to Eat and a Consumer Reports article from October 2006 called "Win at the grocery game," we've assembled this list of eight tips for getting the grocery goods. And keep in mind the wise words of those anonymous Consumer Reports folks: "The perfect supermarket doesn't exist. Where you find low prices, you'll often find lackluster help, long checkout lines, and so-so fresh foods. And where you find great service and goods, you'll pay." #(n1). Shop locally. Sure, we think it's a great idea to buy foods grown near where you live. But what we mean here is this: Unless your home/work neighborhoods suffer drastically in the decent-foodstuffs department, try to shop at markets you pass in the course of daily life. It's a waste of gas and energy (yours as well as your transport's) to schlep around town for groceries. Exceptions: Occasional "destination" trips to, say, the monster Asian mart in the mall. #(n2). Plan ahead. Are you shopping for long-lived staples, such as dried pasta and paper towels, or short-lived goods, such as fresh produce and bread? Divvy up the duties between cheaper big-box stores (for the staples) and pricier markets (for the fresh treats). #(n3). Ditch the kids. Stores love tots, since they're such expert beggers. And you wondered why sugary cereals are placed low on the shelves and the checkout aisles are full of candy. No kids means no fights, no junk, and a faster shopping trip. #(n5). Shop clockwise. 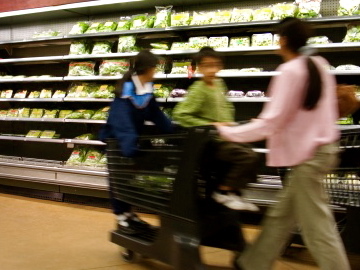 Most supermarket layouts encourage shoppers to move counterclockwise around the store. Go against the flow and you'll both spend fewer dollars and waste less time. #(n6). Suss out a store's offerings. If your local grocery store isn't a co-op, does it offer organic/natural/purer versions of conventional goods? This can be tricky, as some markets shelve everything together (regular and organic produce, for example), while others segregate the items into mainstream (the central store) and fringe (the hippie ghetto off in the corner). #(n7). Bigger isn't necessarily better. It's a drag, but it's worth your while to read the fine print on price labels. Yes, smaller containers of anything usually cost more by weight or volume than big containers — but not always. In general, anything fresh that's heavily packaged and individualized (bagged salad, single servings of fruit salad or yogurt, sliced cheese) will cost more than the bulk equivalent (heads of lettuce, whole melons or tubs of yogurt, uncut cheese). But according to the Federal Trade Commission, you may want to reconsider that bulk purchase of ketchup, canned tuna, or peanut butter. And doublecheck any dry good (toothpaste, garbage bags), especially if it's on sale. #(n8). Save money — maybe. Are you a coupon shopper? Great — if you can resist the impulse to buy items you'd never buy normally, just because they're on sale. If you don't want to bother with paper coupons, you can join a local market's shopping club (which sometimes provides members with discounts) or look for coupons online (both at supermarket websites and places like Cool Savings). But be warned: Shopping clubs and online coupon services generally want you to trade personal info in exchange for discounts. And many supermarkets these days offer all shoppers, regardless of coupons or club status, the same discounts.